This article is about the mountain range in the western United States. For other uses, see Wasatch (disambiguation). Not to be confused with Wasatch Plateau. The Wasatch Range ( /ˈwɑːsætʃ/ WAH-satch) is a mountain range that stretches approximately 160 miles (260 km) from the Utah- Idaho border, south through central Utah in the western United States. It is the western edge of the greater Rocky Mountains, and the eastern edge of the Great Basin region. The northern extension of the Wasatch Range, the Bear River Mountains, extends just into Idaho, constituting all of the Wasatch Range in that state. Since the earliest days of settlement, the majority of Utah's population has chosen to settle along the range's western front, where numerous river drainages exit the mountains. The mountains were a vital source of water, timber, and granite for early settlers. Today, 85% of Utah's population lives within 15 miles (24 km) of the Wasatch Range, mainly in the valleys just to the west. This westside concentration is known as the Wasatch Front and has a population of just over 2,000,000. Salt Lake City lies between the Wasatch Range and the Great Salt Lake. At 11,928 feet (3,636 m), Mount Nebo, a triple peak rising above Nephi, at the southern end of the range, is the highest peak of the Wasatch Range. In some places the mountains rise immediately from the valley's base elevation of 4,330 feet (1,320 m) to over 11,000 feet (3,400 m), producing steep inclines. Other notable peaks include Mount Timpanogos, a massive peak which looms over northern Utah County and is especially prominent from Pleasant Grove and Orem; Lone Peak, the Twin Peaks, and Mount Olympus, which overlook the Salt Lake Valley; Francis Peak overlooking both Morgan and Davis counties; and Ben Lomond and Mount Ogden, both near Ogden. Squaw Mountain over Rock Canyon at sunset as seen from the campus of Brigham Young University in Provo, August 2012. Since they top out just below 12,000 feet (3,700 m), Wasatch peaks are not especially high compared to the Rocky Mountains of Colorado or even the Uinta Mountains (the other main portion of the Rocky Mountains in Utah). However, they are sculpted by glaciers, yielding notably rugged, sweeping upland scenery comparing well with other prominent ranges of western North America. They also receive heavy falls of snow, in some places over 500 inches (1,300 cm) per year. This great snowfall, with its runoff, made possible a prosperous urban strip of some 25 cities along nearly 100 miles (160 km) of mountain frontage. 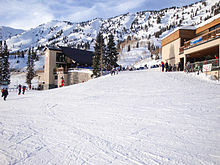 The Wasatch Range is home to a high concentration of ski areas, with 11 stretching from Sundance in northeastern Utah County to Powder Mountain and Wolf Mountain northeast of Ogden. There is also one ski resort in the Bear River Mountains ( Beaver Mountain). Park City alone is bordered by two ski resorts. Due to the low relative humidity in wintertime, along with the added lake-effect from the Great Salt Lake, the snow has a dry, powdery texture which most of the local ski resorts market as "the Greatest Snow on Earth". The high concentration of ski resorts located close to a major urban area, as well as the famed light, powdery snow that's often considered good for skiing, were prime reasons for Salt Lake City's hosting of the 2002 Winter Olympics. Several of the canyons in the Lone Peak area, most notably Little Cottonwood Canyon, have a number of high-quality granite outcroppings, and make up a popular climbing area such as the Pfeifferhorn. Farther north, Big Cottonwood Canyon features tricky climbing on quartzite. The densely vegetated narrow canyons of the Wasatch Range, such as Big Cottonwood Canyon and Little Cottonwood Canyon, are heavily visited; on September 25, 2005, 1,200 automobiles entered Little Cottonwood within one hour. The canyons are located within 24 miles (39 km) of downtown Salt Lake City and the year-round paved roadways can reach 5,000 feet (1,500 m) higher in elevation above the city within a short distance. Dirt roads readily drivable in passenger cars with moderate clearance stretch up from Park City, Heber, and Big Cottonwood Canyon. These reach about 10,000 feet (3,000 m) above sea level and provide impressive long-range high country views. West side of Mount Nebo, the highest peak in the Wasatch Range. Mount Nebo, the highest peak of the Wasatch, is located at the southern edge of the range. The Colorado Plateau comes to its northwest corner here as it meets the southern end of the Rocky Mountains. Immediately west of these two, the Great Basin, which is the northern region of the Basin and Range Province, begins  and stretches westward across western Utah and Nevada until it reaches the Sierra Nevada near the Nevada/ California border. The range is punctuated by a series of geologic faults, chief among them the Wasatch Fault. These faults also formed the Timpanogos Cave. The northern Wasatch Range is punctuated by a series of mountain valleys. While the western side of the range drops sharply to the floors of the Wasatch Front valleys, the eastern side of the range is gentler, allowing for the construction of several ski resorts. The Cottonwoods, a particularly rugged and dense area just east of the Salt Lake Valley, shelters small mountain coves that harbor four world-famous ski resorts ( Alta, Brighton, Solitude, and Snowbird). The eastern slopes of the Cottonwoods drop to the Snyderville Basin, which contains Park City and its two ski resorts ( Park City Mountain Resort and Deer Valley). Much of the eastern side of the range from north of Salt Lake City to the Bear River Mountains is especially gentle in comparison to the rest of the range. The range widens significantly east of Ogden, sheltering a high mountain valley known as the Ogden Valley. Three more ski resorts lie here, as well as several small towns (such as Huntsville, Liberty, and Eden). North of this, the Wellsville Mountains branch off from the northwest of the range, continuing a line of mountains paralleling the I‑15 corridor. This range is noted for being exceptionally thin and steep. However, US‑89/ US‑91 is maintained as a four-lane highway along its entire length through the range at Wellsville Canyon east of Brigham City. Cache Valley, created by the Bear River, is flanked on the west by the Wellsville Mountains and the east by the much denser and higher Bear River Mountains. The northwestern border of Cache Valley is flanked by the Bannock Range in Idaho. The two highest peaks in this area are Mount Naomi and Mount Logan, each just under 10,000 feet (3,000 m) in elevation. The western United States with the Wasatch Range outlined in red. The southeastern portion of the range across Wasatch County transforms into the relatively flat, windswept Wasatch Plateau at an elevation of approximately 8,500 feet (2,600 m) to 9,500 feet (2,900 m). At its southeastern edge, just north of Helper, it runs into the Book Cliffs. Further north, the Heber Valley and Weber River Valley separate the Wasatch Range from the Uinta Mountains, while the Bear River Valley and Bear Lake Valley separate it from lower mountain ranges that mark the western edge of the Green River Basin. Throughout the length of the Wasatch Range, it is traversed by just 7 highways (as well as several rugged mountain roads and unpaved trails). The two most prominent are I‑80 through Parley's Canyon east of Salt Lake City, and I‑84 through Weber Canyon southeast of Ogden. They meet near the ghost town of Echo on the eastern slopes of the range and continue northeast as I‑80. Other highways through the range include US‑6/ US‑89 through Spanish Fork Canyon, US‑189 through Provo Canyon, Utah State Route 39 extending east from Huntsville (a route which is closed in winter), US‑89/ US‑91 through Logan Canyon, and along Idaho State Highway 36 near the northern end of the range. The Denver and Rio Grande Western Railroad had a line through the Wasatch Range, via Soldier Summit Pass and Spanish Fork Canyon. Now operated by the Union Pacific Railroad, the line is used by freight trains, as well as Amtrak's California Zephyr. The Wasatch Range is part of the Wasatch and Uinta Mountains Level 3 Ecoregion,  a temperate coniferous forest. Common trees include Douglas fir (Pseudotsuga menziesii), subalpine fir (Abies bifolia), Engelmann spruce (Picea engelmannii), Colorado blue spruce (Picea pungens), and quaking aspen (Populus tremuloides). Gambel oak (Quercus gambelii) is common on the foothills of the range from just south of Brigham City in the north, to the southern extension of the Wasatch Range. It is not found in the northern portion of the Range. Ponderosa pine (Pinus ponderosa), while abundant elsewhere in Utah is not common in this mountain range, except in plantations in Big Cottonwood Canyon southeast of Salt Lake City and in Logan Canyon, east of Logan. Some individual trees have been found in remote areas of the Wasatch Range that appear to be relic individuals from past populations. Subspecies of big sagebrush (Artemisia tridentata) dominate drier portions of the landscapes. Most of the sagebrush that occurs in the Wasatch Range is mountain big sagebrush (Artemisia tridentata ssp. vaseyana). Many of the valley bottoms at one time were occupied by basin big sagebrush (Artemisia tridentata ssp. tridentata). Most of this subspecies has been removed, however, because it occurred on what constitutes prime agricultural lands. In upper elevations, and on slightly more mesic sites than that of mountain big sagebrush, one can find subalpine big sagebrush (Artemisia tridenta ssp. spiciformis). This subspecies occupies productive sites and often has a lush understory of wildflowers and grasses. Wyoming big sagebrush (Artemisia tridentata ssp. wyomingensis) occurs at the lowest and driest elevations, although much of the Wasatch Range is above the elevation where this subspecies occurs. All sagebrush species, combined, provide critical habitat to greater sage grouse, a species under consideration for listing by the United States Fish and Wildlife Service. In addition to the world class ski resorts, the Wasatch range is home to a host of other outdoor pursuits as well. Hundreds of miles of mountain biking and hiking trails wind through the canyons and alpine valleys of the Wasatch Range offering back country access in very close proximity to a large metropolitan area. Outdoor enthusiasts can also find world class rock climbing and mountaineering on the towering limestone, granite, and quartzite peaks and in many of the surrounding canyons. Winter recreation includes excellent ski touring & ski mountaineering. as well as endless opportunities for snowshoeing. Alpine lakes and streams offer somewhat over-worked fishing opportunities. The Wasatch Mountain Club calendars regular activities allowing one to experience the Wasatch Range. The Utah Native Plant Society regularly conducts walks from spring until fall along the foothills of the central Wasatch Front and in adjoining canyons as the seasons progress. A particularly spectacular location for wildflowers in the late summer is Albion Basin at the top of Little Cottonwood Canyon. The Salt Lake Valley urban area, a major portion of the Wasatch Front. The Wasatch Mountains extend both north and south of the valley. ^ Fuller, Craig. "Wasatch County". Utah History Encyclopedia. Retrieved 24 Mar 2019. ^ Van Cott, John W. (1990). Utah Place Names: A Comprehensive Guide to the Origins of Geographic Names: A Compilation. Salt Lake City: University of Utah Press. p. 390. ISBN 978-0-87480-345-7. OCLC 797284427. Retrieved 24 Mar 2019. ^ Bright, William (2004). Native American Placenames of the United States. Norman, Oklahoma: University of Oklahoma Press. p. 549. ISBN 978-0-8061-3598-4. ^ Sadler, Tiffany (October 5, 2006). "Fall a perfect time to explore Utah's canyons". The Salt Lake Tribune. Salt Lake City: Huntsman Family Investments, LLC. ^ Winward, A.H. 2004. Sagebrush of Colorado: taxonomy, distribution, ecology and management. Colorado Division of Wildlife. Denver, CO. 46 p.
Geology of Utah, William Lee Stokes, Utah Museum of Natural History, Salt Lake City, 1986. Wasatch Quartzite, John Gottman, Salt Lake City, 1979. Wasatch Tours, Alexis Kelner & Dave Hanscom, Wasatch Publishers, Salt Lake City, 1976. Flora of the Central Wasatch Front, Utah. L. Arnow, B. Albee, & A Wycoff, University of Utah, Salt Lake City, 1980. Gori, P.L. and Hays, W.W. (Eds.) (2000). Assessment of regional earthquake hazards and risk along the Wasatch Front, Utah [U.S. Geological Survey Professional Paper 1500-K-R]. Reston, VA: U.S. Department of the Interior, U.S. Geological Survey. Parry, William T. (2005). A Hiking Guide to the Geology of the Wasatch Mountains: Mill Creek and Neffs Canyons, Mount Olympus, Big and Little Cottonwood and Bells Canyons, ISBN 978-0-87480-839-1. Veranth, John (1991). Wasatch Winter Trails, ISBN 978-0-87480-629-8. Winters, Randy (2006). Utah's Eleveners: A Hiking and Climbing Guide to the 11,000-foot Mountains of Utah's Wasatch Range, ISBN 978-0-87480-864-3. Wikimedia Commons has media related to Wasatch Range.